In 1595, Sebastian Cermeno lost his ship, the San Agustin, while exploring the Marin Coast. The Spanish explorer Vizcaíno landed about twenty years after Drake in what is now called Drakes Bay. 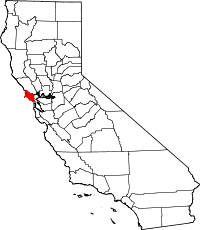 However the first Spanish settlement in Marin was not established until 1817 when Mission San Rafael Arcángel was founded partly in response to the Russian-built Fort Ross to the north in what is now Sonoma County. 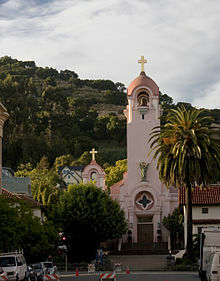 Mission San Rafael Arcángel was founded in what is now downtown San Rafael as the 20th Spanish mission in the colonial Mexican province of Alta California by four priests, Father Narciso Duran from Mission San Jose, Father Abella from Mission San Francisco de Asís, Father Gil y Taboada and Father Mariano Payeras, the President of the Missions, on December 14, 1817, four years before Mexico gained independence from Spain. ^ "History of the University — Dominican University of California". www.dominican.edu. Retrieved March 23, 2017. ^ "US News Best Colleges". Archived from the original on May 24, 2017. ^ "Marin Magazine | Best of Marin County - People, Restaurants, Events, Hotels, Recreation". www.marinmagazine.com. Retrieved March 13, 2019.